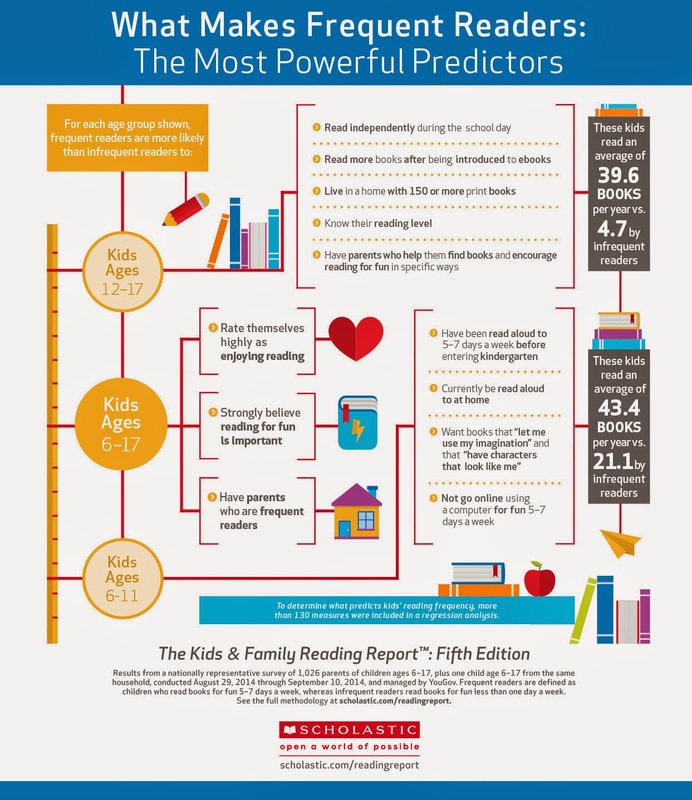 Recently, Scholastic released the 5th edition of its "Kids and Family Reading Report," a national survey on the state of kids and reading. There are five subsections with some pretty cool numbers, and they have great infographics available for download, too. If you get a chance to check out the age group breakdowns on this part, it's really interesting how tastes change as kids get older. The first category (things I experience in my life) doesn't really surprise me. I think a lot of us like to get away from our lives when we read for fun. The second category (having characters that look like me) I found very interesting. I found it very interesting, both that 43% of kids ages 6-17 want books with characters they want to be like because they're smart, strong or brave, and that relatively low percentages purposely look for books with characters that look like them. There are a lot of different conclusions we can draw from these numbers, but I still find the numbers interesting. Okay, I'm done with my reading stats geek fest now. :) But I'd love to hear what you guys think of the results! Are there are any numbers that surprised you? Any that didn't? I loved this! I definitely agree, parents that read and show and instill value in reading are more apt to have kids who love to read. Exactly! If you tell your kids reading is important, but never sit down with a book, what are they going to think?